In a few weeks, Avengers: Age of Ultron will be upon us, introducing the MCU to one of Avengers' most iconic villains. Although this is Ultron's first appearance on film, the character has had a long (and strange) history in comics. Here's what you need to know about the insane robot. Spoiler Warning: The last section of this article discusses events pertaining to Ultron that occur in last week's original graphic novel release Rage of Ultron. If you don't want spoilers, you can skip the last section. When Ultron first appeared, he had neither his name or his backstory revealed — the character first appeared disguised as the villain Crimson Cowl in Avengers #54 in 1968, his robotic visage not revealed until the last page of the story. In the following issue, he was shown to be arobot named Ultron, or more specifically Ultron-5, the creature's fifth evolutionary form. Leading the Masters of Evil against the Avengers, it's revealed in the next few issues that not only has Ultron created a new android designed specifically to combat the team, the Vision, but that Ultron itself was created by an Avenger himself, Hank Pym, a.k.a. Ant-Man. Pym created Ultron based on his own brain patterns, but the robot almost immediately rebelled against its creator upon gaining sentience, developing an Oedipal complex — not just hatred of his "father" but a romantic interest in Pym's lover, Janet Van Dyne, a.k.a The Wasp — and hypnotizing Pym to forget that he had ever created him. Ultron proceeded to upgrade himself more and more (hence why his first appearance is his "5" Form), but with the help of Vision the Avengers thwart the robot's plans. The Vision goes on to become an Avenger himself shortly after, proving that yes, even an Android can cry. Ultron would be used rather sparingly over the next decade, only returning twice to menace the Avengers (and be destroyed) in 1969 and 1974. He would next return as Ultron-8 (as we will see, Ultron loves giving himself numbers as much as he loves wanting to kill all humans) in 1977's Avengers #161 and #162, but this time he was not alone. Ultron wanted a bride. Furthering his insane relationship with his creator, Ultron creates Jocasta, a female robot created in the visage of Janet Van Dyne that Ultron brainwashed Pym into putting Janet's life-essence in. Like his former creation the Vision, Jocasta would realize the evil in Ultron's actions and turn against him, sacrificing her chance at life to alert the Avengers and save Janet. And like Vision again, Jocasta would later go on to become an Avenger, but not before momentarily falling under Ultron's thrall once more. Unlike many long running characters, Ultron's progression as a character rarely changes: He has a new unstoppable form, then it is promptly stopped. This happens in most of his appearances over the 1980s, with cthe haracter being defeated by the Avengers in 1980, and again by the Thing and Machine Man in the crossover team up series Marvel Two-In-One in 1982. A form of the character created by cosmic entity the Beyonder even shows up during the original Secret Wars event. But the last 1980s form, Ultron-12,would explore the robot's Oedipus complex even further. After teaming up with Wonder Man's evil brother the Grim Reaper, Ultron-12 is defeated by the West Coast Avengers, but not destroyed — he has a change of heart, and attempts to rebuild his relationship with Hank Pym. The two begin to bond, but it wasn't to last: the form of Ultron defeated during Secret Wars returns, and Ultron-12 sacrifices itself to save Pym, saying he was glad he could protect his father. The '90s adventures of Ultron would carry on down a path similar to his previous exploits, each cycle starring an upgraded robot who gets inevitably cast down by Earth's Mightiest heroes. Doctor Doom attempted to create an Amalgam of all 12 previous Ultrons in one form, subservient to himself, but Ultron could not deal with all the personalities and went insane, eventually being destroyed by Daredevil and the Inhumans Karnak and Gorgon. Another form, after attempting to upgrade his body with a new form of Vibranium, was defeated by Black Panther, Iron Man and Spider-Man. In 1993 Ultron would return to one of his former plans with a little more success: the creation of a wife. This time based off the brain patterns of Mockingbird, Alkhema fought alongside Ultron against the Avengers but was promptly defeated. Like her predecessors Vision and Jocasta, Alkhema turned against Ultron but unwittingly recreated his new form in the early 2000s due to a subroutine planted in her by Ultron that compelled her to keep rebuilding him. She briefly returned to his side, but she was destroyed for good in when Hawkeye shot her with an arrow made of "anti-metal." The character would return at the end of the decade in the Ultron Unlimited story arc, where Ultron wipes out the population of a small country with an army of lesser Ultron drones before being defeated by the Avengers — a story made most notable by a now-iconic moment where the Avengers burst into Ultron's stronghold and Thor delivers the line "Ultron. We would have words with thee." In the early 2000s, Ultron's role as a villain would become less tied specifically with the Avengers as a whole, and more closely with Iron Man. The first instance of this would be in 2002's Invincible Iron Man, when a former Ultron incarnation rebuilt itself using some of his old armor, but of course was eventually destroyed. A similar, but altogether more freakish event would occur five years later in the first story arc of The Mighty Avengers. At the time, Tony Stark's Iron Man suit was biologically connected to him through the Extremis program. Ultron corrupted the program, taking over Tony's body and transforming it into a new, female Ultron form — a metallic copy of Janet Van Dyne that could also control all of Stark's technology. Ultron was eventually defeated by a computer virus designed by Hank Pym (or, long story short, an alien Skrull agent pretending to be Hank Pym), transforming Tony back to normal. During this time Ultron also expanded out into Marvel's space-bound stories. For the Marvel cosmic event Annihilation: Conquest, the character teamed up with the Phalanx in an attempt to invade Kree space and infest the galaxy. Ultron was defeated by a group of heroes, but the story actually served an alternate purpose in the end: out of the event, a new Guardians of the Galaxy would be formed in 2008 for the first time since the mid-'90s. The same team would go on to inspire a little movie you may have heard about last year. No, not the movie. The comic event of the same name that the movie actually has basically nothing to do with. Confusing, right? Oh, comic books. Ultron would have a few minor appearances in the 2010s, but his next major emergence would also be one of his weirdest. 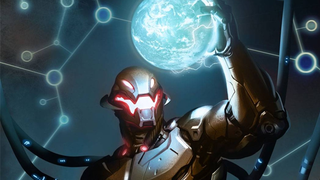 The Age of Ultron event series kicked off in 2013, and saw a world where Ultron had already won, ruling over what was left of humanity and hunting down the last few rebelling superheroes attempting to stop him. When the remaining heroes discover that Ultron is actually controlling the present from a future time period, through the Vision, they send two teams across the timeline: One to the future to combat Ultron, and one to the past to kill Hank Pym before he could create the villain at all. The past team actually succeeds, but it turns out that this was a monumentally bad idea, creating a world where Tony Stark and Morgan Le Fay ruled the world. So they go back in time once more to stop themselves from killing Hank, and instead work with him to create a back door into Ultron's systems that eventually allow present day Iron Man and Hank Pym to destroy the robot, preventing the Age of Ultron from ever happening. But that wasn't the last the comics saw of Ultron. In anticipation of his appearance in the Marvel Cinematic Universe, the character actually recently made a return to comics with a new graphic novel, Rage of Ultron, released just last week, which includes some pretty big changes for the character. The Avengers do battle with Ultron once more, in a form of the robot they had previously sent into space which had returned in an attempt to transform organic beings into robots with a new virus. The conflict culminates when Hank Pym, now the Avenger Giant Man, inadvertently merges with Ultron; this creates a new hybrid that is part Ultron and part his father. Overcome with new emotions, this new Ultron flees back into space to try and process what it has become. Although the Avengers mourn the loss of Hank Pym, it would appear the scientist isn't quite gone, with the last shot of the book revealing that Ultron now has a human heart. Whether this is a state for the character that will be part of the Marvel Comics universe after its reboot in Secret Wars is frustratingly unknown at this point, but if it is, it's an intriguing new path in Ultron's story. After years of trying to understand his creator, Ultron is closer to Hank Pym now more than ever.